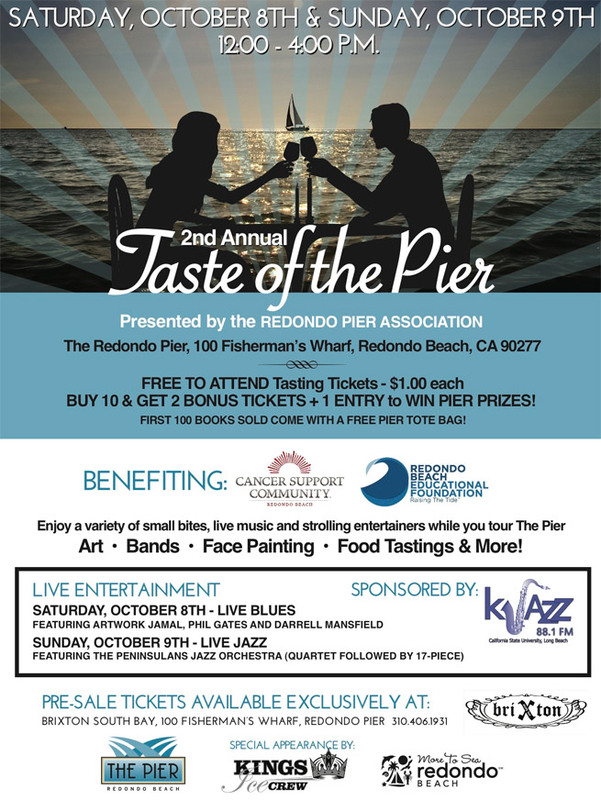 Taste of the Pier: The 2nd annual Taste of the Pier festival runs on Saturday and Sunday (October 8-9) from 12 to 4pm at the Redondo Beach Pier. It’s free to attend; tasting tickets are $1 each. If you buy 10 tickets you get 2 bonus tickets, plus an opportunity to win prizes. You can buy tickets ahead of time at Brixton South Bay, 100 Fisherman’s Wharf, Redondo Pier. There’s also live music and kids’ activities like face painting. Proceeds benefit Cancer Support Community/Redondo Beach and the Redondo Beach Educational Foundation. 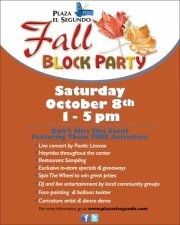 Fall Block Party: Plaza El Segundo is hosting a Community Block Party on Saturday, October 8, from 1pm to 5pm. This free event includes hay rides, live music, face painting, and a chance to win prizes and gift cards from the Plaza El Segundo merchants. Featured attractions also include a free art lesson from ArtLife Gallery and a dog show at PetSmart. Oktoberfest: The Alpine Village in Torrance is hosting its (ongoing) Oktoberfest celebration, the oldest and largest in Southern California. On Friday, October 7, and Saturday, October 8 the (adult) celebration runs from 6pm until midnight. On Sunday, October 9, the festivities run from 1pm until 6pm and are geared toward a family audience. Every day offers Oom-pah-pah music, contests, beer tasting, traditional German fare, and sing-alongs. General admission is $20 for Fridays and Saturdays; $5 for Sundays (kids under 12 are free). Also worth noting: Anyone who arrives dressed in a dirndl, beer wench or lederhosen outfit gets half off admission (or free admission on Sundays). Water Harvest Festival: Learn about water and conservation while enjoying free food, games and treats at the Water Basin’s annual Water Harvest Festival on Saturday, October 8, from 10 am to 2 pm. The festival is held at the Edward C. Little Water Recycling Facility at 1935 S. Hughes Way in El Segundo; free parking and free shuttle service is available. Participants age 7 and over can also take a tour of the water recycling facility; you must wear closed-toe shoes. New this year: Bring an old pair of shoes to donate to SOLES FOR LIFE; get a free conservation device. CicLAvia: The CicLAvia street festival, to be held on Sunday, October 9 from 10 am to 3 pm, features 10 miles of L.A. city streets that are closed to traffic. The event is designed to attract bicyclists, pedestrians, skaters, and strollers out into the streets, where they will encounter musicians, dancers, costumed characters, rallies, and rest stops with water. 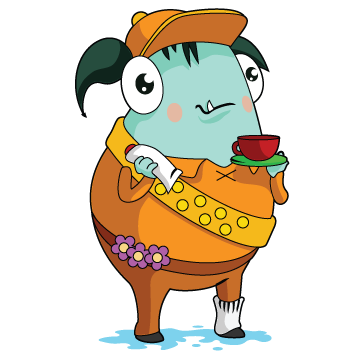 Participants can start wherever they want, and do as much or as little as they like. Participation is free. 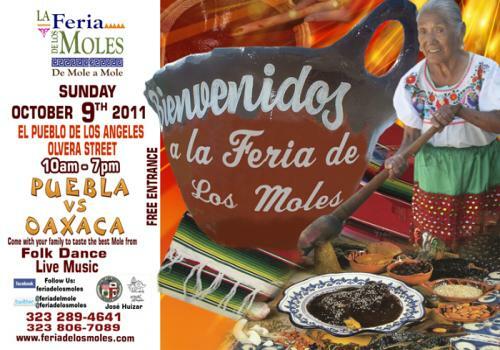 Feria de los Moles: What’s your favorite mole sauce? The 4th Annual Feria de los Moles features more than 13 varieties of Mexican moles ranging from sweet and savory to hot and spicy. There will be plenty of live music and folk dancing too. It takes place on Olvera Street in Los Angeles on Sunday, October 9 from 10 am to 7 pm. Admission is free. California Avocado Festival: If you’re really willing to travel out of the South Bay, the California Avocado Festival is a great bet. The festival, celebrating California’s “favorite fruit” runs from Friday, October 7 through Sunday, October 9 in Carpinteria. 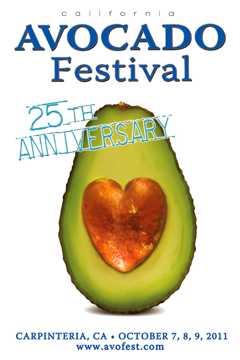 The festival features avocado ice cream, fried avocado, the world’s largest vat of guacamole, 40 arts and crafts vendors, more than 60 bands, and lots of prizes. Admission is free.